I’m experiencing some serious linen lust with the new season baby bedding collections from DwellStudio. Whether it is luxe, bohemian or Scandi style you are looking to infuse into your little one’s space, DwellStudio delivers. Sophisticated colour palettes and stylish patterns are a signature we’ve come to expect from DwellStudio over the years, but we still can’t get enough. The Aimee Bedding Collection features soft watercolour leaves printed in the gorgeous autumn colours, berry, acid yellow and grey. 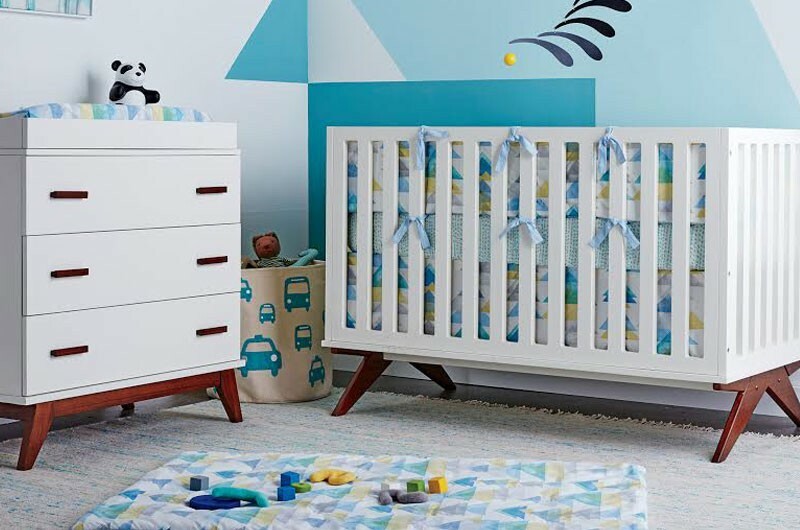 The cot bumper, crib skirt, play blanket and stroller blanket are all double-sided with a coordinating painted stripe on the back for mixing and matching. Complementing this designer collection is the Boho Cross Stitch Pillow for $39. I love the feminine design and hand-stitching that really adds a cosy note to the room. Seamlessly marrying fresh colours like aqua, blue and lemongrass with a hand-printed, bohemian triangle design, is the Triangles Bedding Collection. This design creates a chic and tranquil environment that parents and babies alike will love. The collection features overlapping triangles on the one side and a coordinating Seurat-style brushstroke on the back that balances each other beautifully. 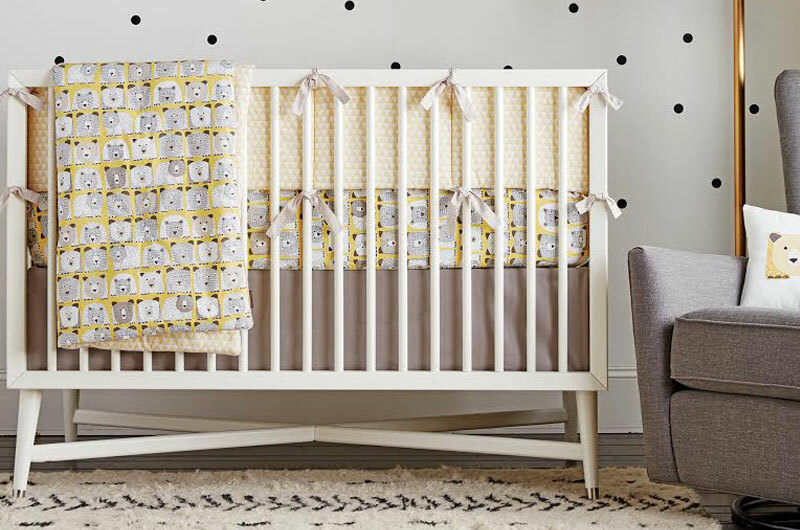 With a fun and modern personality to suit a gender-neutral nursery, the Bears Bedding Collection is perfect in black and grey on a citrine yellow background. Designed in-house, the sketchbook bear illustration creates a graphic pattern that definitely channels Scandinavian style. 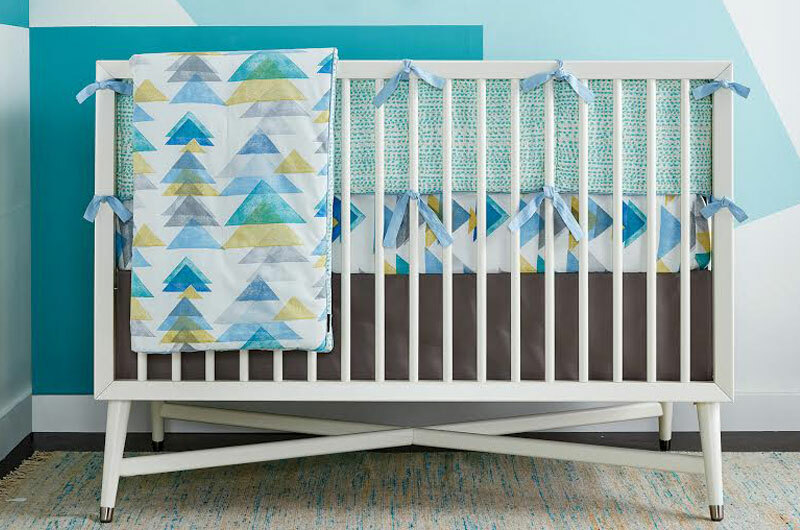 The bumper and play blanket are reversible with a coordinating Pyramid triangle design in white and yellow. See all the sheets, blankets, bumpers, skirts and more for each of these new collections at DwellStudio’s online store. Prices are standard across the three collections and start at USD$35 for the crib sheets and changing pad covers and go up to USD$99 for the reversible crib bumper. With shipping options limited to the USA and Canada though, the new range is currently not available in Australia and we are stuck in the lusting stage… for now.